Features:Made of cast iron, strong hardness, not easy to break, very durable.Make the best use of blank wall space for added storage.Provides added space and better convenience while decorating the wall.Can be using as floating shelves, plumbing pipe shelf, industrial shelving, industrial furniture, shelf support, shelf brackets, ect.Suitable for bedroom, kitchen, living room, bar, cafe, no matter what the occasion it is the best choice. 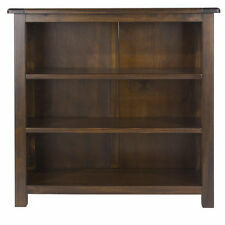 D.
The Boston low bookcase features two adjustable shelves and has a beautiful dark warm finish. It is built from a combination of oriental songwood which is very similar to pine and hardwood veneered panels apart from the back and drawer bases which are of strong plywood to give the unit added stability and strength. 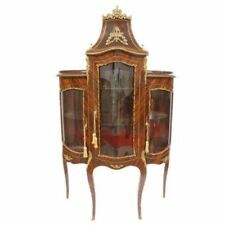 This cabinet, with an antique design, is a great organizer in the office, living room, bedroom, etc. It will surely make a great addition to your bedroom, study, or even hallway. The cabinet is constructed from high quality wood MDF and pine wood with a white painted finish for durability, which will give you years of service. Triangle Storage Rack Features: Provides added space and better convenience while decorating the wall. A strong and elegant shelf support with a simple, triangle design. Triangle shelf bracket suitable as a shelf support. Strong enough to be using as bookshelf, exhibition stand,garden shelf, external wall brackets flower pot hooks etc. Suitable for families, offices, hospitals, hotels, factories, shops, supermarkets, cafes, bars, etc. Shabby Chic Ornate Shelf Unit. In a distressed antique white finish. Decorative Bird Cage Design Display Storage. With handle for suspension if required. UNLOVED TV CABINET, COULD BE MADE INTO BABY WARDROBE ETC, SOLIED!!! HOWEVER IS ALSO SOLIED & HAS SOILED HINGES TO IT TOO. I HAVE HAD IT A WHILE & IT NO-LOINGER FITS WITH MY PROPERTY. This is a very good and rare Arts & Crafts bookcase/writing desk. The desk is made of solid oak and is in excellent condition throughout. The oak also has a large amount of inlay which is in very good order. 19" on the base. 12" deep on the top. We date this bookcase from the mid 70s. SUPERB RETRO TEAK G PLAN WRITING DESK/BOOKCASE. This is a very good retro teak writing desk/bookcase. The desk has a pull down front and inside various drawers pigeon holes etc. Pipe Wood & Steel Shelf Features: Provides added space and better convenience while decorating the wall. Vintage industrial water pipe design, beautiful and elegant, show out your wonderful aesthetic and taste. Can be using as floating shelves, plumbing pipe shelf, industrial shelving, industrial furniture, shelf support, shelf brackets, ect. Suitable for bedroom, kitchen, living room, bar, cafe, no matter what the occasion it is the best choice. Easy installation, and long service life..
Mantle Clocks. Wall Clock. Hooks & Coatstands. At Four Seasons Liverpool we aim to bring you the highest quality and choice. We hold a large range of Shabby Chic, Oak, French, Modern and Venetian furniture. 2 Shelf Simple Bookcase. Made from solid mahogany wood which is only sourced from sustainable plantations. 2 Shelves. Solid mahogany Victorian bookcase. Concealed drawer at the top of the bookcase. 2 adjustable shelves. Solid mahogany 2 drawer low bookcase. 2 useful drawers finished with solid brass swan neck handles. Finished with a wax polish to enhance the natural wood. Fixed shelf; height approx 24-25cm between each shelf. Petite Bookcase. Made from solid mahogany wood which is only sourced from sustainable plantations. Finished in a traditional wax polish to enhance the colour of the natural wood. Small and narrow. FRANCE BAROQUE STYLE. Wood colour : GOLD. GOLD GLASS CASE. FRANCE BOULLE STYLE. Wood colour : MULTI. GLASS CASE. Use as an extra serving space for a buffet or dinner party, as a handy sideboard in your dining room or hallway, or as a storage solution in a nursery. What will you do with this delightful piece?. Antique white table with 2 drawers and 2 shelves. FRANCE BAROQUE STYLE. GOLD GLASS CASE WITH MARBLE TOP. Wood colour : GOLD. Solid mahogany Sleigh style bookcase. Handcrafted from solid mahogany. FRANCE BAROQUE STYLE. GOLD GLASS CASE WITH MARBLE TOP. Wood colour : SILVER. Description Brand Unbranded MPN Does Not Apply EAN Does not apply Material Cast iron Classification Non-folding Rack Applicable Lounges, bathrooms, bedrooms & kitchens Installation Type Wall Mounted Type Rack/Tower, Shelving, Shelving Unit Use Ornaments Main Colour Black - Natural Iron Finish Number of Shelves 2 Style Vintage, Steampunk, Loft Living, Antique pipes.